Gin is in right now, and any bar worth its jam jar-glasses has an array of various high quality flavours to peruse. From Cornish Clotted Cream to Yorkshire Tea, there’s a quirky gin to suit every palette. I personally saw a seaweed flavoured gin the other day which certainly appealed to The Little Mermaid fan in me. 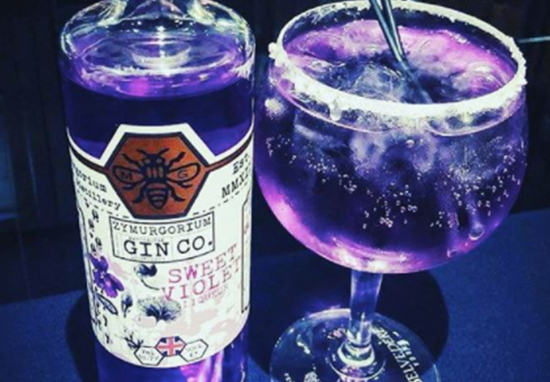 Yes I’m talking about parma violet gin, and more specifically Zymurgorium Manchester Sweet Violet Gin Liqueur. Sweet violet heaven made for the gods? Well not exactly, but a wonderful liqueur nonetheless. Great replacement for violet based liqueurs as the role of 20 botanicals really do provide a unique taste. Enjoy any how you like. Sweet Violets supposedly were a gift from Zeus the king of the Greek pantheon as a comfort to Io for whom he loved but had to turn into a heifer to save her from Hera’s wrath! Sweet Violets are a beautiful find and have a very unique sweet pastelly taste and a strong scent. As a drink it can be used exactly like Crème de Violette but as it has been refined with over 20 other botanicals contained in our Gin made in Manchester’s first Gin distillery; it is also equally as good on it’s own, with lemonade, mixed with ice cream or in baking! Try making an Aviator cocktail with this much superior violet manchester gin liqueur! At £25.89 for a 500ml bottle, this isn’t exactly ideal for your regular Friday-night pre drinks. However, with Valentine’s Day coming up, this might be the ideal, candy-scented bevvy to send your beloved’s heart a’fluttering. Jules studied English Literature with Creative Writing at Lancaster University before earning her masters in International Relations at Leiden University in The Netherlands (Hoi!). She then trained as a journalist through News Associates in Manchester. Jules has previously worked as a mental health blogger, copywriter and freelancer for various publications. When not Lad-ing about, she enjoys cooking, reading and trying not to fall over in Yoga.